The iPhone 5 was released in late September 2012. As of this writing, it has been out for over half a year. It took until now for Magpul to finally release it's first batches of it's new phone case. can't blame them though since Magpul has been working overtime almost 24/7 to get as many AR-15 Pmag's manufactured before pending state and national firearms laws potentially outlaw its magazines for the public. Magpul has made it their mission to flood the market with as many affordable magazines as they could causing other products to take the back burner. It currently looks like for the time being pro-2nd amendment proponents have been able to push back the anti firearms agenda. A couple of weeks ago Magpul shipped the first batches of iPhone 5 cases out to distributers and by the time you are reading this, it should be on dealer shelves. If you have never used or seen a Magpul iPhone case, they are thin one piece rubber/polymer covers that snap over your phone like a clam shell. They are molded with a waffle texture to mimic the Magpul Pmag AR-15 magazines and available in the same colors to match as well. Two additional colors are available -- a blaze hi-vizability orange and a pink. The aggressive texture and rubber feel allows you to easily hold onto your phone without fear that it can slip out of your hands. The thinness of the design makes it unobtrusive and does not add too much bulkiness to the phone. The rubber case has some give and keeps it out of the way allowing you to still be able to handle and use the phones controls. 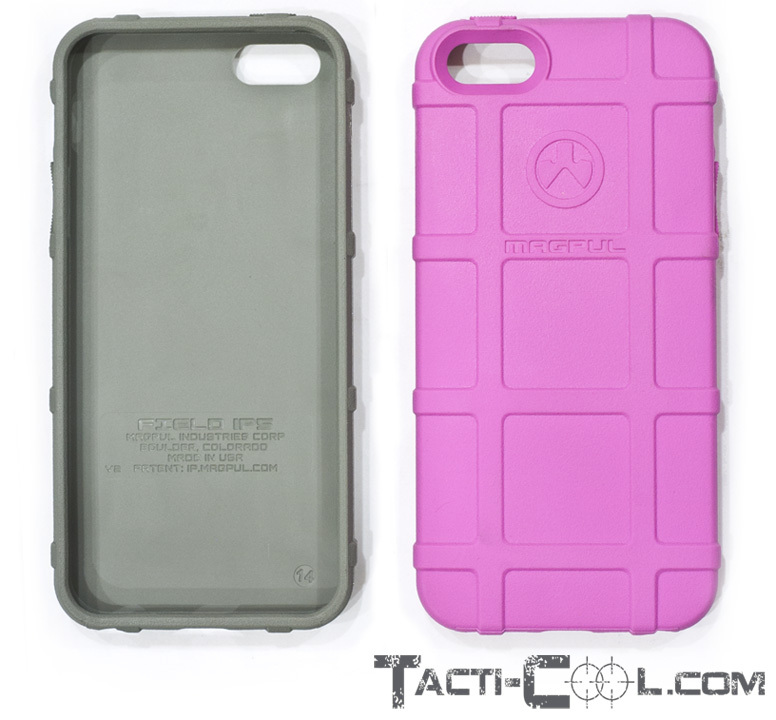 At the 2013 Shot Show, I was told by Magpul that they redesigned the formula used in the iPhone 5 cases. In the prior iPhone 4 cases some of the cases would leech silicone onto the back of the phone. Although it would not damage the phone, it was somewhat annoying. The new iPhone 5 version should not have that problem. Above: a Foliage Green Magpul Case Showing the top of the case with the on/off button. The Pink case shows off the bottom of the case with the headphone jack, speakers and sync port. Since the Magpul case is made from a rubber polymer material it does not impede the use of the power button. A close up view of the bottom of the case with both the headphone and sync cables attached. Notice there is plenty of room to easily access these ports with your cables. The side view of the case highlighting the ute button and the large access area provided to easily manipulate the slider button. The rubber polymer material does not impede the use of the rocker type volume button. These are available now with an MSRP of $12.95. This is a cheap and easy way to protect your phone and make it Tacti-cool.